The most popular parish and capital of Jersey, St Helier is a busy town with a population of over 28,000 and is the Island's main retail centre. Offering a modern shopping experience, it features many high street stores found in the UK, yet still manages to maintain its character. 30 Hotels, 5 Guest Houses, 4 Apartments and 1 Bed and Breakfast. Completely refurbished in 2005, Mountview Hotel is a stylish and contemporary 2 star hotel providing a friendly welcome, impeccable service, and a good standard of cuisine. 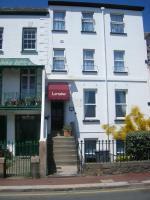 The Mountview Hotel is ideally located in St Helier within easy walking distance of the waterfront and town centre.